Whenever I see these messages, I feel they are so significant because everyone is fighting a battle of some sorts. Every youth, every devotee, every person in the world is all the time trying to do so many things and all the time we feel it is so difficult trying to manage everything. When Bhagawan says, “Life is a game; play it”, He wants us to take inspiration from Hanuman, for he teaches us how to play the game of life. In fact earlier Giridhar, you mentioned that Bhagawan has Hanuman in the stadium where the students go not only in the morning but on so many occasions during the day. So the other thought that occurs to me is about one event that invariably happens in the Hill View Stadium every year — the Annual Sports and Cultural Meet. SG: Absolutely! In fact for the last two decades plus. BP: If you look at the way the Sports and Cultural Meet unfolds - the spirit with which the students do everything, their feats, their motivation, the kind of displays, etc., and then read all these sayings all around the stadium, and finally notice Hanuman above, it seems to me everything just falls in place so beautifully. SG: Even as you describe this, I feel as though the Hill View Stadium symbolises life itself. It is a field of action. The Sports Meet reminds us of beautiful colours and action and all the students marching in a disciplined way. DA: In fact Hanuman is called so because He is without any anumana or doubt. All that happens in the Hill View Stadium is indeed symbolic. If you have clarity of your goal and you know for whom you are doing it, how to perform your tasks and how to use intelligence well, you will be able to reach the goal. So both devotion and intelligence which Hanuman characterises are required as instruments to attain our destination. BP: We say, ‘Life is a game; play it’, but to play the game of life first we need to be very clear about the goal. SG: During the Sports and Cultural Meet, students really slog and work hard in the sun; all of them get tanned completely. BP: I remember when I was in grade 11, the year I had just joined Swami's school, I was selected for karate. We were supposed to practice this martial art for almost a month, minimum of 2 hours daily under the sun. When my relatives and parents saw me after the Sports Meet, they couldn't recognise me! The January 11 ceremony is awe-inspiring every year, no doubt but that also means long hours on the ground for days together... but this is a stress and strain that is most welcome for the students because this is one beautiful chance for them to make an excellent collective offering to their Lord. SG: In this age when the youth are too concerned about their looks and skin tone and spend a lot on cosmetics, here are a bunch of men and women ready to rough it out and get tanned. For what? 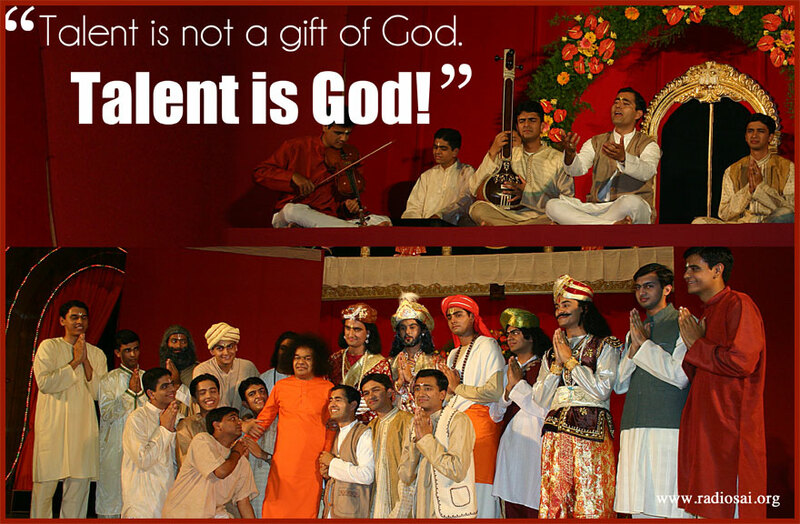 If you ask any student, he/she would say, “We are doing it for Swami.” That is most important. Everybody is clear about the goal. The Sports Meet event reminds me of what Shakespeare said — ‘All the world is a stage and all men and women are but actors in it’. 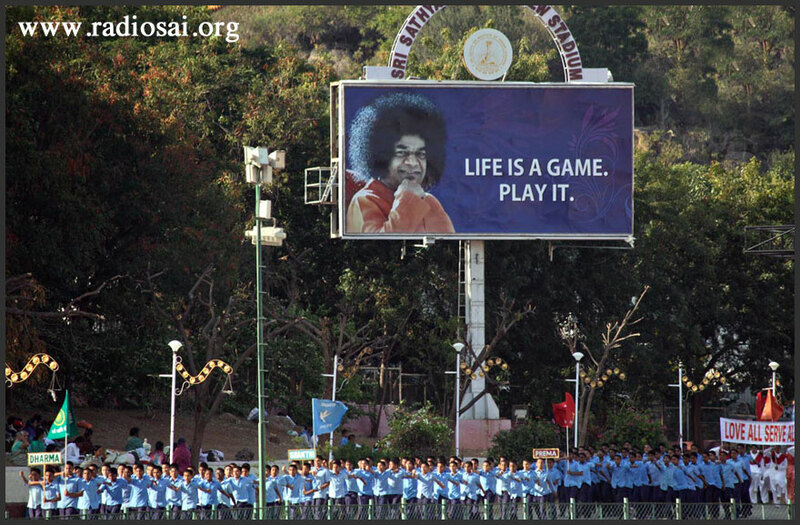 In the same way the Hill View stadium looks like the stage of life itself where all men and women are actors and their performances are dedicated for only one purpose — Bhagawan Baba, who sits there and watches their performances. DA: Actions can also be of various kinds, depending upon the inner motivation that drives them. This kind of action dedicated towards pleasing the Lord is satwic (pure and noble) action. Swami minces no words in talking about what's going wrong in the world today. It is not only because many rajasic (restless, aggressive or passionate) and tamasic (slothful, following base instincts) people are very action-oriented but also because satwic people are not taking up action and responsibility for reforming things from where they are. Finally Easwaramma Day arrived. Swami distributed T-shirts with the message ‘Love all, Serve all’ and the symbol of the Institution — ‘Satyam Vada, Dharmam Chara’ (Speak the truth; abide by your duty). Wearing those with full dedication and with the name of Sai Rama on our lips, we tried our best to please Bhagawan in any way we could — distribution of food and clothes, filling up the plates, etc. every time they got this chance to participate in this work, they were left with precious lessons. Bhagawan was so pleased, He said, “Yes, the boys have served well. They have taken My name and done service. Now boys, come on. Let's have photographs.” Would you believe it? On a single day we had four individual photographs and two group photographs – all in different locations! I think this is the message of Hanuman's life — Satwic people should be action-oriented. SG: The other message I can draw from this is that you have to dedicate your energies and talents in service to God. That is what the Lord looks for — how much you have shared your love and served the rest of the world. BP: I am tempted to say that when we say, ‘Life is a game; play it’, in any game what really matters is how good you serve. If you serve well say in tennis, you win points easily. Therefore service is important for a game as well as in this game of life. DA: And you have to start always with ‘Love all’! In fact in 2003 in a drama, I observed the same thing. I played the lead role of a singer who dedicated whatever he'd learnt from his Guru back to the Guru as service to society. There was another person who wanted to sell his talent and make money. Finally the latter loses his voice, comes back and is taken back into the Guru's fold. The message was very clear — whatever talent you have is a gift from God. Offer it to God as naivedyam (offering to God) and whatever comes out of it accept it as prasadam (gifts from the Lord). Swami was so happy with that one-line dialogue that Ganesh was given more importance than me, the hero of the drama. That is because he offered to Bhagawan the fullness of his abilities in that one line with such dedication that Swami accepted it as an offering of love. It is such a profound thing. All the creativity that we bring into the Sports and Cultural Meet or into dramas and even the drama of life itself — all creativity has its origins in God. So we should live our life for God because all the gifts we have are verily God. BP: They have to be used only in the service of the Lord. 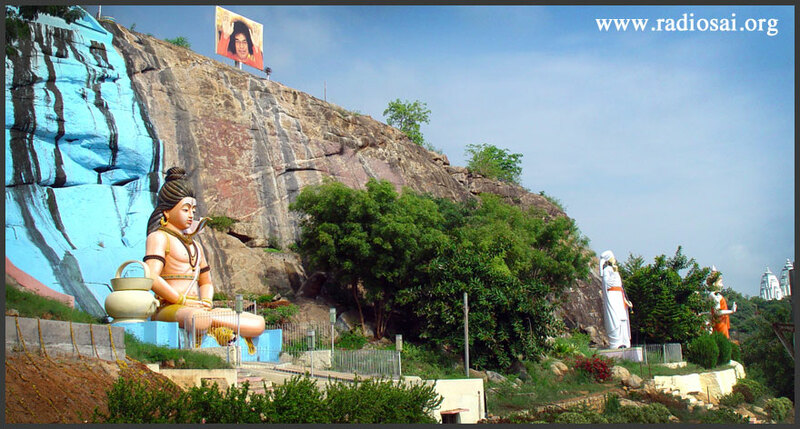 SG: While describing the virtues of Hanuman, Swami often says “Shanthudu, Gunavanthudu, Balavanthudu, Hanumanthudu”. If we take the first quality — ‘Shanthudu’, how should we serve the Lord? ‘Shanthudu’ translates into ‘the peaceful one’. Swami says Shanthi (peace) is the quality of a devotee, which is epitomised by Hanuman. Swami explains that Shanthi means equanimity. As we play this game of life, we will meet with success and failure. Swami says that the yardstick for the measurement of bhakthi (devotion) is the shanthi of the bhaktha (devotee). The yardstick of how devoted you are to the Lord is in how neutral or equanimous you are in the face of victory and defeat, joy and sorrow; that is shanthi. Hanuman had this precious quality. Swami gives a beautiful story to explain this. 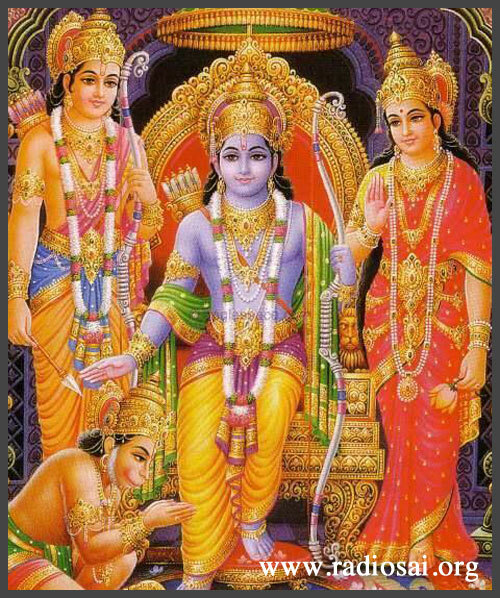 After the war was fought and won, Lord Sri Rama was seated in the assembly of every single warrior who had served him. Of course, the greatest of the warriors or the servants of the Lord, Hanuman was also standing there and so was Lakshmana. That would be a normal man's perspective. But the way Hanuman did service was unique and it is an example for all of us to follow. Look at this attitude of seva — absolutely no ego. This means there is no end to seva and every moment you should aspire to serve the Lord. BP: In fact as you narrate this, I am reminded of the episode in Ramayana where Hanuman is crossing over the ocean in search of Mother Sita. Seeing him on this huge mission and given the challenges he has to face and the tremendous amount of work involved, the Mynaka Mountain comes up from under the ocean and requests him to rest for a while. That is his passion and dedication to service. All he does is just touch the mountain so as not to disappoint it and then moves on. For him to think of rest while doing the Lord's work is almost a sin. DA: That is the spirit of our students too and I have seen it on many occasions. During the Sports Meet, the boys even give up food and rest for many days. For 48 or 52 hours they do not sleep but continue their practices and rehearsals. There is a small instance I want to share about how that passion is imbibed in many of our students. This happened long ago before the Shiva statue was built in the Hill View Stadium. A teacher who was the director of dramas at that time shared this. Where the Shiva statue stands today, there was then a small store room for keeping cement bags, tools and implements. As the boys were having study holidays they were all studying in the stadium. Bhagawan's car arrived and all of them came close to His car. But would the devotees of the Lord miss an opportunity when they come to know of it? The news spread like wildfire in the hostel. All the boys came with whatever implements they could gather and within an hour or two the structure was dismantled, even before the instructions could be sent to the sevadals! This is the love between the devotee and God. In the evening when the boys were sitting for darshan, Swami just came by, looked at them, and with a twinkle in His eye just smiled. The story was complete. which will be continued in the coming weeks.